This is a break off from the traditional methods of maize milling process such as pounding and grinding. 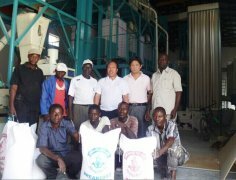 The advantages that the maize milling machinery offers is that they are able to grind completely all the parts of the maize grain. Tough peels and embryos are broken down together with the starch to provide an almost completely balanced diet. Therefore, today’s maize milling machinery provides a chance to remove the embryo part and grind the starch part on its own. Peels and embryos removed are used as nutritional supplements for stock feed. Hammer mills use the effect of impact on the grain to grind them. There are some hammers in the unit that are used to strike the grain as they pass through the grinding unit. The grinding unit is usually comprised of a horizontal shaft that holds multiple hammers that strike the grain to produce the desired flour. The flour then drops to lower chambers through gravity. Other machinery uses propelled air to guide the maize flour into a holding container. The second type of technology used for construction of maize milling machinery is the plate type. It uses two plates of steel or cast iron to grind flour through a shear mechanism. The plates are laid facing each other and grains are passed through the middle to be grounded. The plates are usually grooved to provide that effect of grinding. The grains are usually grounded from the nearest part of the blades all the way to the end. By the time the grains reach the end of both plates, they are fine grounded. Plates are usually aligned in a vertical or horizontal position. The problem with this method is that it can get heated up because of friction. Therefore, little power used to make the process work. 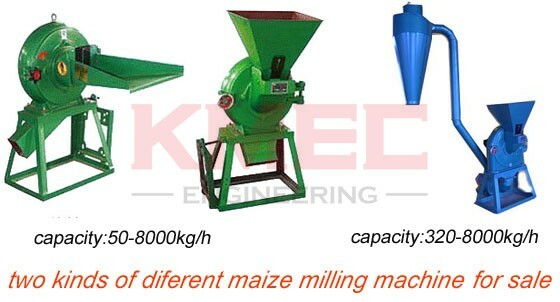 Some manufacturers of maize milling process machinery are found in countries such as India, South Africa and China. India is a large producer of maize milling process machinery with many suppliers found in the country. China is also a great supplier of this type of machinery.